This morning, before I went on with my daily routine, I had my morning cup of tea and a dose of Facebook. From there I've learned that today is a National Pancake Day. Well, it took care of my dinner plans and I carried on with my Thursday 'to do" list. Quite quickly I realized that I am missing a few ingredients for my pancakes. See, what we call pancakes are actually crapes that come with different fillings. Some like it savory (me), and some like it sweet (the rest of my family). The sweet filling wasn't an issue: I have plenty preserves to cover a few miles of pancakes. As of savory part I knew exactly what I wanted but I had to get it. 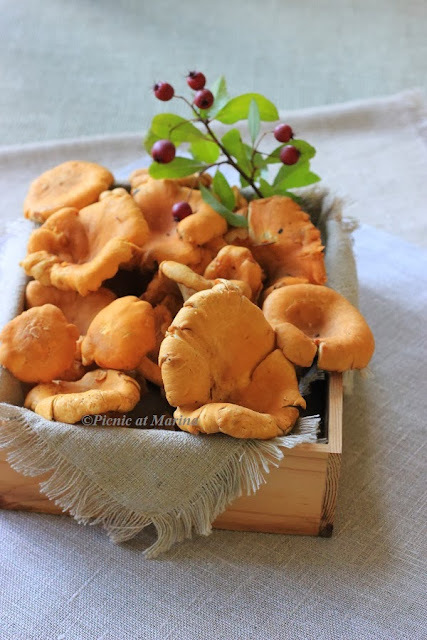 If I were as good as my mother in mycology (part of biology that studies fungi) I would go foraging for some wild mushrooms, specifically chanterelles. But because of fear of being lost in the woods keeps me always on the hiking trail my chances to pick some mushrooms were very small. Why did I want to go through all this trouble? 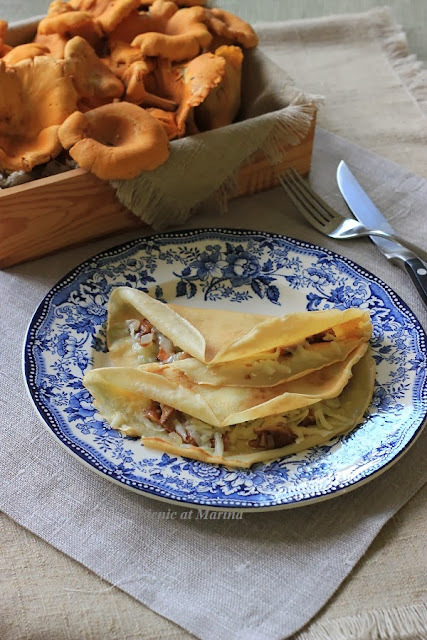 Well, because a) it is a chanterelle season (and I guess all other mushrooms too), and b) I wanted my crapes stuffed with mushrooms and cheese. There's no recipe today, everyone knows how to make crapes, right? or pancakes? Then just choose your topping. For me it was fresh chanterelle mushrooms, sauteed in a little butter with shallots. Then I topped crapes with mushrooms and some Manchego cheese, folded it and warmed on one side in a skillet until cheese started to melt. Oh my! 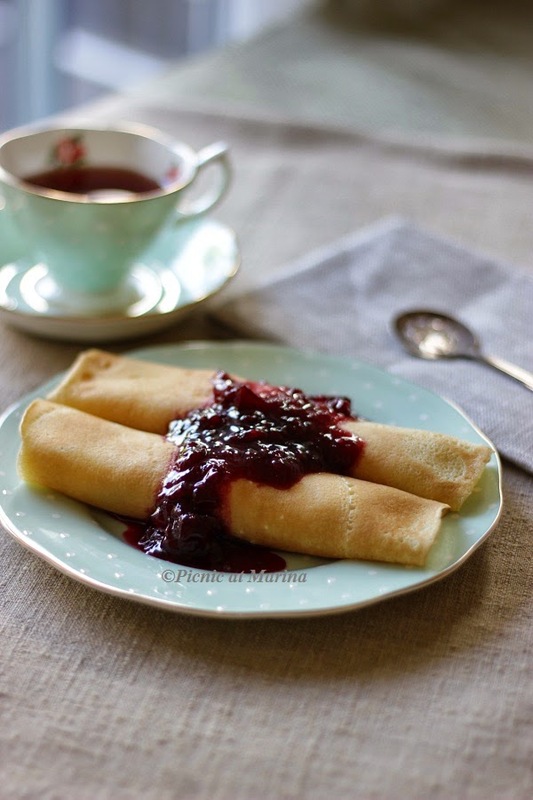 For my sweet loving part of the family I made ricotta cheese filling with a touch of honey, and topped the crapes with raspberry preserve. As of that National Pancake Day, it's confusing. 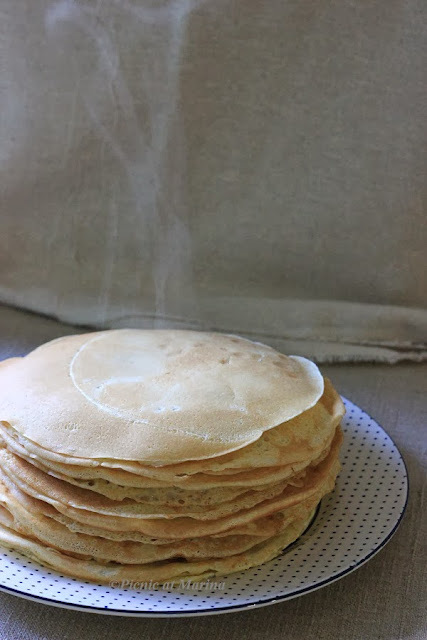 I've seen it being celebrated on February 5th; then on February 28th; then on September 26th, then in Russia it's a whole Pancake week before Great Lent. Never heard of National Pancake day, certainly not over where I am. You are right, anything can be rolled of stuffed into pancakes/crepes and I am loving the mushrooms inside. Hi Liz, yes, it was very strange being at the same place and at the same time. I hope to get into blogging conference next year. That would be fun! Your crepes look beautiful so thin as paper. I have yet to make so thin with gluten free flour. And the filling is incredible using chanterelle mushrooms. Hi Balvinder, thanks for the compliment on the capes. I am sure you can master the gluten free as thin as the gluten one, or even thinner. Good like crepes! I'll take them with either a sweet or savory filling. Or both! Good job with these - thanks. He hee! I can eat pancakes or crepes ANY day. I love savory ones too (for breakfast) and sweet ones for snack. I have never tried mushrooms and cheese as filling, and what a great idea! I love mushrooms and try to put in my dishes where I can add (but then my kids complain why we have mushrooms everywhere!). Looks so delicious and now it's my turn to make it! Hi Nami, mushrooms and potatoes are a good filling for crapes too. Easy dinner! My son complains about mushrooms too, but it's only because it's his job to brush it off any debris (yes, kids in this home have chores :) Thanks for visiting me here! Missed you! Ha, pancakes are great at any time... I love the way the French do them... making a buckwheat "galette", filled with cheese, potato, egg, sausage etc, and then a sweet, wheat crêpe for dessert. In England "pancake day" is always on a Tuesday, in March, called Shrove Tuesday. My mother would always serve up massive amounts of pancakes then with sugar an lemon juice... yum!